Looking for cycling shoes? Check out our Buyers Guide! 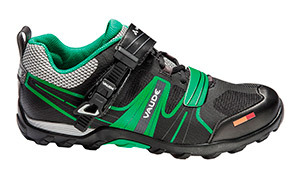 Modern bike shoes serve one main purpose: the perfect transmission of power from foot to pedal. These efficient shoes reduce the loss of energy when pedaling and the leg muscles are more efficiently put to use. This energy saving can become particularly useful on longer stretches and steep ascents to ensure the cyclist can pedal for longer and more effectively. The principle of maximum power transmission - how does it work? Two elements come into question when talking about optimum power transmission from bike shoe to pedal: The mechanical connection between sole and pedal and the stiffness of the sole. The connection between pedal and sole is made possible by a system, that on the one hand uses the so-called click pedals and on the other requires a bike shoe with integrated cleats. The combination of the two makes these shoes incredibly useful when pedaling uphill: This allows the cyclist to pull the pedals up from the back which lets them cycle uphill at lightening speed. The stiffness of the bike shoe sole is also an important factor. The stiffer it is, the less energy that flows through the sole and the more direct the power transmission becomes. Bike shoes have a variety of different features depending on their recommended use. 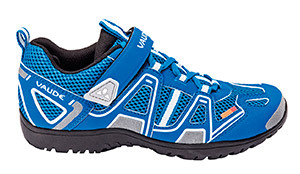 There are special types of shoes used for a racing bike, a mountain bike and a trekking bike. Road bike shoes have extremely stiff soles, as the aggressiveness that goes into pedaling these bikes is determined by weight. The soles tend not to have a tread, as getting off and pushing the bike is generally kept to a minimum. Mountain bike shoes prioritize either a stiff sole (racing oriented) or a sole with a tread suited to walking (all-mountain oriented) depending on your riding style. In any case, the MTB sole will always have some sort of tread that makes walking on unpaved surfaces possible. Bike shoes for trekking tours are generally less stiff and provide a natural rolling foot movement on hike-a-bike sections in the city. Like most types of shoes that have a sports function, bike shoes come in specific variations for both women and men. The main difference here is the fit, the look also often corresponds. When buying bike shoes, you should - unsurprisingly - put the highest priority on a firm, good fit. If you end a long day of cycling with blisters on your heels, ankles and toes, then you most likely will not enjoy cycling for very long. The size of your bike shoes should be selected to ensure your heel is comfortably firm and the toe box should under no circumstances be too tight, to avoid pressure points. There is often the option of using an insole to adjust the shoe perfectly to your foot. The fit is also influenced by the different types of closures. Ratchet and hook and loop closures make the shoes more stiff while lace-up shoes are much more comfortable to wear. An overshoe lets you wear your bike shoes in any weather conditions. Even though wind and splashing water can be quite refreshing on summer rides, it will send shivers down even the toughest cyclist's spine during the colder seasons. Depending on what you need, overshoes come in lightweight wind and/or water repellent variations for quick downhill rides on your racing bike or in a more robust shape with mus and waterproof features for muddy mountain bike trails. Numerous manufacturers have started to put their own bike shoes on the market. Giro, Sidi, Pearl Izumi, Shimano or Northwave all provide bike shoes for different uses and levels, while also offering a wide range of different sizes and fits.